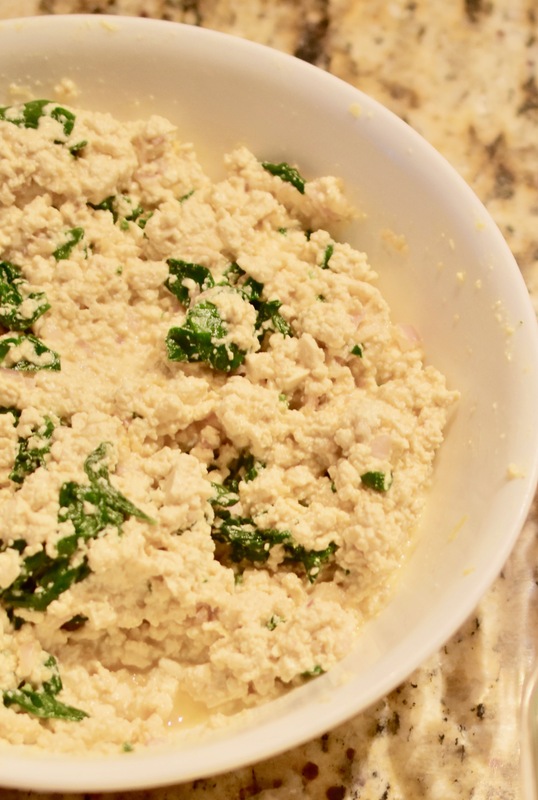 Tofu Ricotta can be used as a filling for lasagna, manicotti or as a topping for pizza. You can make a double batch and freeze part of it for when you need it again. That way you have part of the work already done. This particular recipe has steamed spinach in it. However, you could leave it out if you so choose. My thought is to try to get greens in my meals as often as I can. In a large bowl mix together: tofu, tahini, nutritional yeast, shallot, nutmeg, lemon zest and juice. Thoroughly mix tofu. Add spinach to tofu mixture and stir until well combined. The mixture should hold together well, but not too wet.